Back when I was growing up, the child of a nutritionist (yes! I am genetically coded to be a nutritionist! ), we rarely, if ever, had any sugar in the house. Sure, Mum allowed me treats from time to time. I gorged on Halloween candy every year like my classmates, and I successfully mined my Christmas stockings for candy canes, tiny marzipan fruit, and chocolates wrapped in Santa suits. But we didn’t keep any junk in the house. Growing up in this environment did not render me immune to sugar cravings. Despite my virtuous upbringing, I still had a sweet tooth that pestered me regularly. So, it’s for this reason that you could sometimes find me gnawing desperately on a raw roll of cinnamon bark. True story. 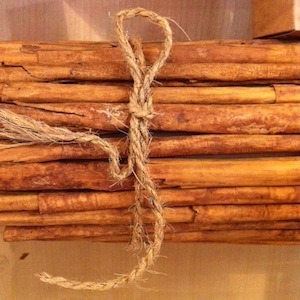 Those fibrous, thin quills of cinnamon bark are not so bad in a pinch. Recently, a YouTube meme called “The Cinnamon Challenge” went viral. The challenge was to consume a heaping spoonful of cinnamon powder and record what happens. If you want to watch hundreds of people bugging their eyes out as they cough gusty clouds of cinnamon dust out of their mouths and noses, I’ll meet you back here in 45 minutes after you fall down that internet rabbit hole. Of all the spices, cinnamon is pretty popular. Much more than say, lovage. Oh, the irony! Cinnamon gets more lovage than lovage. Most likely, the cinnamon you have on your spice rack is from a species called cinnamomum cassia(sometimes called cinnamomum aromaticum or just cassia). However, I recommend trying to find Ceylon cinnamon (cinnamomum zeylanicum, sometimes called “true cinnamon” or cinnamomum verum). Ceylon cinnamon has a sweeter, softer flavour than the harsher cassia cinnamon. More importantly, if you are hoping to achieve some of the health benefits of cinnamon, Ceylon cinnamon is your better choice, as it contains vastly lower amounts of a naturally occurring compound called coumarin. Coumarin has been shown to be potentially liver toxic and is present in relatively high amounts in cassia cinnamon. So, if you are planning to consume more than ½ tsp per day of cinnamon, choose the Ceylon variety. In addition to infusing our lives with some spicy sweetness, what else does cinnamon have to offer? Cinnamon has been shown to improve blood sugar stability by improving insulin receptor sensitivity, and may help to prevent post-meal blood sugar spikes . In herbal medicine, cinnamon is classified as a carminative, which means it prevents the formation of gas in the intestines. Cinnamon is warming in nature and is also used to stimulate digestive “fire”. If digestion is feeble and sluggish, and you are prone to bloating, give cinnamon a try! Cinnamon extract may inhibit the growth of tumours by boosting the immune system’s ability to identify and kill of abnormal cells . Alzheimer’s disease is sometimes referred to as “Type 3 diabetes”, so it makes sense that blood sugar regulation and cognitive function are related. Poor insulin signaling is often associated with cognitive decline. Therefore, likely due to its blood sugar balancing effects, cinnamon appears to improve performance on mental tasks, even in the presence of a high sugar diet . Cinnamon also appears to reduce plaque formation in the brain . Now, on to some delicious, spicy, warming cinnamon recipes!